A British autistic woman has told the United Nations (UN) of the “clinical misogyny” and “misjudgements” that have led to autism being viewed as something that only affects white males, and of the violence and abuse experienced by autistic people. 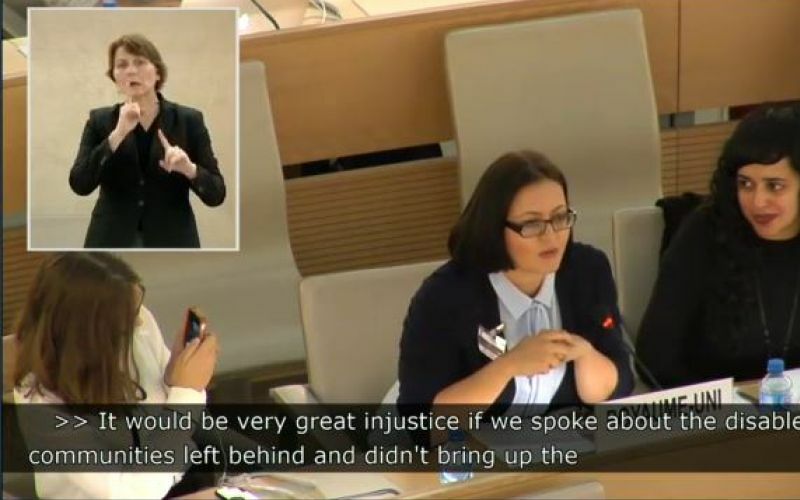 Carly Jones, who has two autistic daughters, was speaking this week at the UN Human Rights Council’s annual Social Forum in Geneva, which this year was devoted to marking 10 years of the UN Convention on the Rights of Persons with Disabilities (UNCRPD). Jones (pictured, giving evidence) said that she was told eight years ago that it was “impossible” to have two autistic daughters, and since then has campaigned in the UK and globally about autism and girls. She told the three-day forum: “Autistic females have suffered from a clinical misogyny past and that needs to be left in the past. She said that more than 90 per cent of the autistic community, before diagnosis, had suffered some form of abuse, while they were nine times more likely to take their own life than non-autistic people. Jones said her own research showed that nearly 80 per cent of autistic people feel unable to call helplines and use the telephone in times of crisis, while they have a life expectancy that is 15 years lower than average. She said there was a need to focus on goals three (health and well-being), four (education) and five (gender equality) of the UN’s 2030 Agenda for Sustainable Development. She also said that one of her daughters had to be home-schooled because of “misunderstandings in the education system”. Jones has set up the Olley Edwards Academy in Berkshire in a bid to end the isolation of home-educated autistic students. The forum session also heard from Lieven Bauwens, secretary-general of the user-led International Federation for Spina Bifida and Hydrocephalus, who said that “serious human rights violations” were “all too common” among the people his organisation represented. He said their estimates suggested that about 80 per cent of the 300,000 children born annually with spina bifida and about 80 per cent of the half a million children who develop hydrocephalus in the month after birth die within their first year. He said that the birth of a child with spina bifida or hydrocephalus is “met with a lot of prejudice and stigma” in many countries, while in many low and middle-income countries “essential health care is withheld” from them. He said: “We get reports of infanticide because parents are not supported and do not see another solution. He added: “I am sure that colleagues representing people with Down’s syndrome can tell similar stories. A representative of the Indonesian Mental Health Association spoke of the “huge discrimination” faced by people with mental health conditions. She said that people with other impairments were treated according to the social and human rights model of disability, whereas people with mental health conditions were “still within the medical model of disability”. She said: “In my country… they have to take medication first before they can take involvement in other parts of life, which is totally unfair. Pratima Gurung, from the Indigenous Persons with Disabilities Global Network, spoke of the particular barriers faced by the world’s 54 million indigenous disabled people, who face “multiple social deprivations” and “shouldn’t be left behind”. She said that many support programmes aimed at disabled people are inaccessible to indigenous communities, and called for more to be done to listen to disabled people “on the ground” and to “discuss their life experiences”. Silvia Perel-Levin, from the International Longevity Centre Global Alliance, told the forum that older people were “sadly seen as less deserving of support to maintain their autonomy and live independently in the community”, and faced abuse, including social isolation, physical restraints and disrespectful treatment. She called on countries to recognise this discrimination and “ensure an equal application of disability rights across the life course”, and said there was a need for a UN convention on the rights of older people. Dr Penny Hartin, chief executive of the World Blind Union, congratulated the 27 countries that have so far ratified the Marrakesh Treaty, which came into force on 30 September. Countries that ratify the treaty agree to introduce an exception to domestic copyright law for visually-impaired and other print-disabled people, which means that they and their organisations can make books in accessible formats without needing the permission of the author or publisher. The treaty also allows accessible versions of books to be imported and exported, again without the permission of the copyright-holder. Hartin said: “The ability to have access to books in accessible formats is a basic human right that the Marrakesh Treaty addresses. She said that if all countries ratified and implemented the treaty it would mean a “huge step towards full equality”. The forum session – which was examining accessibility and non-discrimination – was moderated by Professor Anna Lawson, director of the Centre for Disability Studies at the University of Leeds. She said at the end of the session that it had been “disturbing to be reminded of how people are left behind, even though we have had 10 very successful years” of the UN convention. She said: “There is still a lot of work left to be done… we are not going to succeed in the next 10 years unless we start to address some of these complex interactions as they operate to exclude and leave behind. “We need those conversations and collaborations.